Rockmount Golf Course has been cleverly designed to ensure that the land’s natural features are incorporated throughout the 18-holes and the undulating course offers a verity at every turn. There are four par trees, four par fives and the remainder pat four holes, the total distance being 6,410 yd‘s. Water comes into play in the form of streams with a lake at the 11th and 14th to present the golfer with the ultimate challenge. 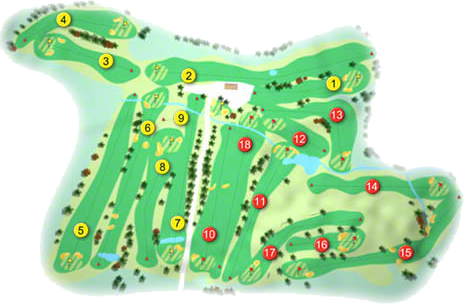 The entire complex covers 120 acres with panoramic views and excellent greens giving satisfaction to all players. Rockmount Clubhouse is tastefully decorated in old brick and solid oak creating a warm homely atmosphere. From the dining room window there is a panoramic view of the golf course with the backdrop of the famous Mourne Mountains. The proprietors, Robert Patterson and his wife Diane are totally involved in the day to day running of the complex, which creates a very personal atmosphere and helps maintain a high standard both on the golf course or in the restaurant. Organizing company corporate golf outings complete with all meals and after dinner speeches are a specialty arranged by Diane. Hospitality is second to none and a friendly welcome awaits all who visit Rockmount Golf Club. The Ladies of Rockmount Golf Club won the Northern Regional Final of the Ladies Miele Irish Interclub Foursomes at Slieve Russell Golf Club in 2010; when they beat Larne Golf Club by 3-matches to 1-match. They were led by Andrea Patterson with Leanie Power who beat Roma English with Audrey Faukner by 6 and 4, they were followed by Ciara Agnew with Jan Lindsay who won their match by 2-holes against beat Sarah O'Neill with Barbara O'Neill, in the penultimate match Diane Patterson with Carol McGrath lost by 1-hole against Jessica and Janice Boal, the bottom match of Noreen Mikhael with Marie Donnelly was a 4 and 2 win over Gail McNabb with Debbie McNabb. They made their way to Glasson Golf Club to compete in the National deciders on Sunday 19th September, where they met the Southern Regional Champions and eventual green pennant winners Thurles Golf Club in the All-Ireland Semi-Final and lost out on a count-back. They were led this time by Jo Donaldson (11) with Leonie Power (16) who lost their match to Rose Maloney (12) with Margaret Lonergan (14) by 4 and 3, they were followed by Ciara Agnew (16) with Jan Lindsay (18) who won their match by 3 and 1 against Orla McKevitt (10) with Fionnuala Corcoran (17), next up was Diane Patterson (15) with Carol McGrath (22) who beat Mary Coman O'Neill (14) with Lorraine O'Keeffe (14) by 2 and 1, in the bottom match Noreen Mikhael (15) with Maire Donnelly (22) lost out to Marian Finn (8) with Susan Troy (25) by 2 and 1. The Ladies of Rockmount Golf Club were runners-up in the All-Ireland Junior Cup at Athlone Golf Club on the 30th September 2007 they beat Galway Golf Club by 3 matches to 2 matches in the Semi-Final and met Dun Laoghaire Golf Club in the All-Ireland decider. First up was Marie Donnelly against Phyl Glavin who lost out by 3 and 1, she was followed by Grace Downey who lost to Sheila Clancy-Nolan by 6 and 5. Next up was Andrea Patterson who halved her match against Martina Lee. The penultimate match of Carol McGrath gave some hope to the Ladies from Carryduff when Carol had a very convincing 6 and 5 win over Mary Dempsey. However it was not to be as Noeleen Houston lost out to Jo Ebbs by 5 and 4. Rockmount Golf Club won the County Championship in the J. B. Carr Diamond Trophy in 2004. Rockmount Golf Club won the, Sam Rutherford Memorial Cup in 2000, when the team was, J. Robinson, G. Goodfellow, M. Wilkinson, J. Miller, C. Childs, P. Greenwood, P. Mearns, R. Patterson and T. McCreery, they were captained by M. Lawlor assisted by G. Willis. Rockmount Golf Club won the, Junior Cowdy Cup in 2001, when the team was, J. Campbell, M. Foreman, A. Patterson, J. Hinds, W. Hogg, R. Jamison, C. Paul, P. Banford, D. Stronge, T. J. Johnston, D. Reynolds, T. Branagh, I. Scott and N. Willis, they were captained by J. Bloomer assisted by H. Moore. 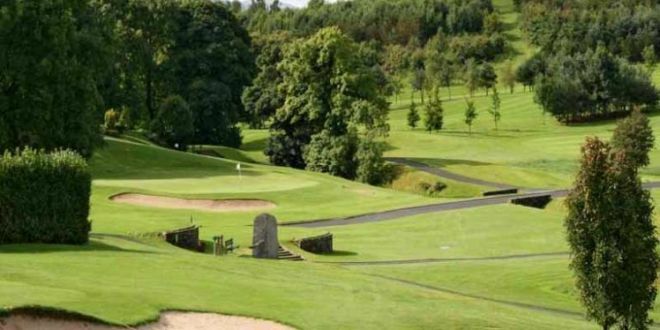 Rockmount Golf Club won the, Jack Craig Memorial Mixed Foursomes in 1998, when the team was, Alan Shrieber, Jerry McWilliams, Noreen Mikhael, Leonie Power, Diane Patterson, Pauleen, McWilliams, Barbara Fleet, Paul Mearns and Peter Coffey, they were captained by Harold Robinson. The course officially opened on the May Day - Monday 8th May 1996, when European Ryder Cup player Darren Clarke performed the opening ceremony and then played in a Fourball when he partnered Robert Patterson to a 2 and 1 victory over European Tour player Raymond Burns and sports presenter Mark Robson. A large following of spectators enjoyed the occasion and the course officially opened to the Rockmount Golf Club Members the next day.